In August of last year a group of former Holga camera employees from Hong Kong decided to launch a Kickstarter campaign to launch a digital version of the beloved asian toy camera. The original Holga debuted in 1982, and has since become a favorite of many artists due to the lack of complexity and flexibility. Their goal was to get the $50,000 dollars needed to begin production, but demand was so great that they exceeded that goal in just 4 days. Ultimately the project exceeded $300,000 and more than 2500 backers during the 60 days it was active on Kickstarter and they continue to get orders via Indiegogo here. The camera is as low tech as a digital camera can get, owing very much to its roots as a toy camera. With a manual shutter lever, exposure time is as flexible as possible and hard to gauge. In addition, the only selections possible are a switch on the bottom to toggle between BW and Color modes, and the power dial on top allowing you to select between simulating 135 or 120 film. You additionally have the option of attaching the flash or not via the hot shoe on top. Everything else is done by feel and experience alone. As you can see from the sample images below even with very little automatic control the camera provides decent quality and good dynamic range. The second camera I received is the Lytro Illum, an extremely advanced camera using what is called Light Field imaging to capture all of the available light in each pixel. This not only provides superior dynamic range, but allows for what Lytro calls "living pictures" because by capturing all of the light in the lenses field of view you have the ability to change the depth of field and point of focus after acquiring the image data. In addition, the technology allows the camera to export 3D images. With manual focus, 8x optical zoom, and dynamic range equivalent to 80-3200ISO it is perhaps the most advanced still camera ever built with a single lens. As you can see from the linked pictures below, you can share images that the viewer can choose a point of focus in on demand, a feature unique to Light Field technology. At an MSRP of $1300 this is an amazingly expensive camera, but incredibly fun to use. If it could shoot video as well it could be the perfect all around camera. Fortunately, Lytro has moved on to trying to change cinematography and as result the camera can be found on Amazon for $387 dollars from some vendors. Seventeen years ago today my life was a lot different than it is now, and what I thought my life would end up looking like bears no resemblance to current circumstances. I was living in the house I grew up in down in Woodburn, OR back then. I worked as a Tier 2 support representative for Dell computers and had just broken up with a long distance girl friend who lived in New Jersey. The breakup had been rough enough on me that I was thinking leaving my job and becoming a monk at the Mt. Angel Abbey might be a good way for me to put my years of religious study to use. One year to the day later would find me waking up in a hotel room with my little brother the day before my wedding. It was the kind of change only God could bring into reality. I had met an amazing woman, my career had taken off and I was now managing technical support team I was part of the year before. Carrie and I would be moving into the first home I would ever own instead of rent. And still, on that day I had the audacity to think I knew what my future might hold. Kids, career growth, I was thinking this was a sign it was all going to get better from here. Fast forward four years and life hasn't been what that 24 year old dreamed and planned for the day before his wedding. We bought a new house to be closer to my job and I was later off a month later. My dad went in for an angiogram and never made it out of the hospital after bypass surgery led to a fatal secondary infection. The kids we had hoped would come right away doctors are telling us will never come. The difference is now I'm not alone, I have an amazing wife, and we are resolved to follow the path God puts us on instead of worrying about what we don't have that we had anticipated and dreamed of. So 12 years ago today Carrie and I were in the hotel room she had booked for a romantic weekend to celebrate our 4th Anniversary. Instead of celebrating we were pouring through hundreds of pages of case files, praying about whether a young brother and sister were supposed to be our kids. One year to the day later, a process the State DFS worker told us takes 18-24 months was finished and a family court judge signed the papers changing their names and making them ours forever. Fast forward 11 years and our lives have certainly changed and been stretched by these two amazing additions to our family. That cute little boy, who came to us with reports from school that he had a hard time learning is about to graduate from High School with a better than 3.0 GPA. His little sister, who we were warned had more severe learning issues and may always need occupational therapy starts her first job in 2 hours and will graduate next year. Carrie is in LA today, but is flying all night to make it home so that we can celebrate our 16th wedding anniversary tomorrow. Tonight, I get to take my son and daughter to dinner to celebrate another Adoption Day. I'm not a big sneaker head, but Nike chose this weekend to blow the shoe game to pieces twice. First with the new Jordan's pictured here. Dubbed Horizon Premium they are a cross between a classic Jordan design and hand beaded Native American moccasins. Truly the most unique and creative design to ever ship under the Jordan brand. Then, they release a new app just for sneaker heads called SNKRS, a combination storefront and online community promising access to the latest dropping shoes. This time of year is different for everyone I guess. How we feel about the the "Holiday Season" is shaped pretty strongly by our past experiences, our childhood memories, and in some cases unfortunately family drama. My Christmas memories are pretty full of all three to be honest, but it has always been a time of year when I was excited. I was eager to see if I made the right gift choice for a loved one. I was anticipating vacation time with the family, even if it just meant more time sitting home playing games or watching TV together. I couldn't wait for the feast that was Christmas Dinner, and the traditions that came with it like my Mom's ambrosia salad or my Uncle's Strudel. This year the holidays are here, and it doesn't feel like I'm two days before Christmas. We've got the tree up, but at this point we haven't even gotten any presents under it. Carrie and I have gotten some of what we wanted to get for the kids this year, but have been so busy with critical issues over the last few weeks that shopping has fallen off the radar. Christmas dinner, a Fat Boy's holy meal holds no promise this year with a restricted diet eliminating 75% of the food I would be looking forward to on our dinner table. If I was feeling better for it I probably wouldn't sound so resentful saying that, but after a week the digestive problems restrictions are supposed to be solving aren't improved and even more foods are being eliminated from my diet. Old friends and family are still grieving the loss of a close friend from my school days who's decline started around Thanksgiving and whom passed on December 4th. As I write this my Mother-in-law is asleep in a chair at the hospital bedside of her husband, and I'm getting ready to head back to the hospital to join them while we try to find answers as to why my father-in-law who really has become "Dad" in the 16 years of my marriage had a series of seizures last night after several strokes in the last couple of months. With his condition as serious as it is I've spent much of the last two days preparing myself that he might not make it to Christmas. I've had to hold volunteers together at the pantry we run as a family and church body, weighing keeping volunteers (who have become like family to all of us) informed, against the immediate family's need for SOME privacy and the need to keep things on track so that the more than 200 families that depend on is for food every week aren't adding food to their list of burdens this Christmas week. With all of this going on its easy to justify why the "Joy of the Season" seems to be in short supply. Please keep our family in your thoughts and prayers this week. I'm heading back to the hospital, you have a Merry Christmas everyone. Here in the Pacific northwest it's another wet and windy night in a time of year known for wet and wind. The weather isn't what is keeping me up tonight though. I'm not worried about the wife and kids any more than usual. They are all asleep, the wife 3000 some miles away until tomorrow night. What's keeping me awake tonight are thoughts of a good friend from high school that somehow I let time and distance sweep out of my life. We lost him last week, and family and friends are poised to gather tomorrow morning to say goodbye. Not past 40 years old and gone. The medical cause of death is complicated, but the bottom line is addiction and his personal demons lost their fight with his better angels. I know he had better angels. We grew up close to each other in a town that wasn't very big anyway. His dad taught our journalism class in high school. His mom was one of our youth leaders at church. Something happened though. Where I was able to wander in and out of party life in high school, and drink whisky all night tonight and not need a drink in the morning he couldn't. I know it's insensitive and politically incorrect for me to be sitting here drinking a bottle of Irish whisky while I talk about losing a friend to alcohol, but it's my website. I didn't know this was the direction my words would take me when I poured the drink and started writing. What I did know is that losing Patrick drove home that even the best of us can be lost in the blink of an eye. He was a gentle soul who loved art and photography for all that he tried to talk rough sometimes in school. It also made me wonder what is it that has made some relationships hold on over time and some fade into the background. Twenty-one years ago when we graduated I never would have bet that Packy and I would go almost twenty years without talking to or even seeing each other. Of course three years before I graduated I would have bet against making it to 25 myself. Time can change your life and your priorities. So tonight I think about the unfortunate twists and turns that separated friends, and lift a few glasses of my favorite Irish whisky while I wish an old friend was here to share it with me. It isn't the first time it's been done apparently, but it's the first time I've seen it. Chevy Truck's ad agency worked with a company called Americhip to put a video player inside the page of my magazine. It powers on when the plastic tab you see at the left side in the fold pulls out and allows the battery to complete the circuit. You select which video file to play with one of three buttons on the right hand side. On the back of the page is a perforation that reveals a micro-USB connector. I tried plugging it into my computer but it didn't show up as a drive, so it appears to only serve as a charging port with video files hard set in the memory chip. I'll play around with maybe tearing it down and seeing if the parts are hackable over the weekend. Sorry posts have been so slow in the last couple of weeks. My father in law came through surgery fine, and is now in short term rehab for a few days while he gets his strength back. Until Tuesday that meant a lot of driving across town to the hospital to fit around normal life. Now that life is back closer to normal I can get things caught up. I'll have some amazing dinners from the last couple of weeks including a Bacon wrapped Blackberry Pork Loin Roast I'm particularly proud of from last night coming your way, as well as reviews of everything from cigars and humidors, to Whisky from the folks at Caskers.com, new journaling systems from BulletJournal.com via their Kickstarter project, and clothes from Ript Apparel and Dickies. It's going to be a busy weekend. Got an interesting press release and invitation from a new web hksting platform today, and accepted their invitation to be a founding member when they launch in coming weeks to see what their engine does to Fat Boy Heaven. The Grid proposes to let AI make content placement decisions freeing up the publishers time to create. I'm intrigued by the concept, but only time will tell how well the idea translates to a blog like ours. Stay tuned when we launch the experiment, it will be unique if nothing else. As I write this post I'm waiting for Carrie to get home from work. Yesterday marked the 10th anniversary of a judge signing paperwork making us parents of two amazing kids, and today marks our 15th wedding anniversary. Just a couple of months ago we celebrated the fact that Carrie had reached the 5 year mark after surgery and was "officially" cancer free. Carrie has a birthday coming in a few weeks and then less than a month from today I turn 40. It's a big year around here. Looking back to where my life was 16 years ago I never could have predicted the twists and turns life would bring. I knew the first time I met Carrie that I was going to marry her. It was April of 1999, and we met for dinner one evening after work. We had met online and were getting together just as friends since we lived so close. At the time neither of us was looking for a relationship, but in talking with so many couples over the years that's usually when God decides we are ready. We both had busy work lives and finding time to get together was hard, but convincing Carrie that I was worth making time for was harder. Somehow I was the first guy this amazing woman had ever dated. Less than a year later we were married, and in the words of Jerry Garcia "What a long strange trip it's been". The fifteen years since have had amazing highs and heart breaking lows. From the low of learning we couldn't have children to the high of adopting the two most amazing kids we could ever hope to have call us Mom and Dad. From the torture of Her cancer diagnosis a week before Christmas to the joy of successful surgery and being declared cancer free five years later. From the pleasure of seeing our kids grow from the broken kids they were when met them to the amazing Man and Woman they have become. The loss of family members to disease and friends to time and distance. Through it all I have known the comfort and love that only she could bring to my life, knowing that God brought her to be the perfect anchor for me in the storm of life. Over the years I have had friends get married and have families, and heard numerous sermons preached on marriage and family by some amazing speakers. I have heard people complain about traditional marriage vows that included "honor and obey" in the wife's vows and not the husbands, and even my Mother had questions about the words staying in our ceremony. When Carrie and I talked about it she said something that has never left my mind. I don't even know that she remembers saying it that night, but she said "If I had any doubt you would die for me like Jesus did I wouldn't be saying 'I do'. If you can keep your vow I can keep mine." I have no idea what I did to deserve anything that life has brought my way, but as a great Rabbi once said to his student "I don't ask God 'Why Me' when the good things happen, what right do I have to ask 'why me' when the bad things happen?". The only answer I need is that God brought her into my life 16 years ago because he knew I couldn't have made it to where he wants me to be without her. I don't think we are there yet, but I know we are closer than we have ever been. Can a wide range and a few tricks make Dell a player in the tablet market? Dell sent me several of their tablets to review, and they run the full range from their Venue 8 inch Android tablet through their Venue 11 inch core i3 Windows 8.1 Tablet with Keyboard. What remains to be seen is if the range of OS choices and hardware is enough to make an impact on a crowded tablet market. I've spent most of the week with the new FireTV Stick from Amazon, and have set it up both on TVs and computer monitors during my time with it. All I have to say is Roku, Google, and Apple better watch out! As always, Gizmodo and Kinja have teamed up to put together a comprehensive list of CyberMonday deals for all things tech and geek, I'll post deals as I find them but their list is a good place to start today. Microsoft is selling the V-Moda LP2 CrossFade headphones that won our headphone comparison this summer for only $99 as a CyberMonday special while supplies last both online and in store for those of you who live near one of their Apple Store clones. Run, don't walk to grab these while you can! Amazon has discounted the price on the AeroPress, voted numerous places the worlds best coffee maker and one of our personal favorites. Normally $30, it is now $25 and a great deal for the coffee lover in your life this holiday season. We reviewed the AeroPress here early in the life of Fat Boy Heaven, you can check out what we had to say about it there and follow the link below for a great deal. Yesterday morning I opened me email to find a message from Mr. Garth Brooks talking about his new album, Man Against Machine which is set to be released in a few weeks. He was excited about this great idea one of the guys at GhostTunes (the site he launched to sell digital versions of his music) came up with. The concept was to record a quick description of the song over the preview sample so that we could hear Garth's own thoughts about each song on the album. Since the website is called GhostTunes and it was already the end of October they decided to launch the preview on Halloween. Head on over for a sneak peek, it sounds amazing. I can't wait for the album and Garth finally touring again after all these years. "...a friend of mine at GhostTunes asked if we would take a different look at sampling for this new record...he wanted to know if we would speak a little bit on each song as a snippet of the song was playing. Because he asked, we went into studio and tried it. We were all surprised to hear how cool it turned out. Because it was his idea and his ask, I felt it fair to keep this to GhostTunes. Because it is GhostTunes, Halloween seems like the perfect time. So, for 24 hours, starting at midnight Thursday night, October 30th and for the entire 24 hours of Halloween, 2014, a sneak-peek at the new album will be available..."
Coming Soon: HemingWrite, "The Kindle of typewriters"
Hemingwrite is a new digital consumer product for writing composition developed by Adam Leeb and Patrick Paul. It features a distraction free experience with a singular focus on the writing experience. The product is one of 20 new hardware devices competing in the Engadget.com Insert Coin competition this week. The competition highlights electronic hardware inventions from around the world culminating with the top teams invited to the Engadget Tech Conference in New York. Eligible companies are early startups which not have received any angel- or venture- capital financing and have not yet shipped products to consumers. can't wait to get my hands on one of these! This would be perfect for sitting down away from everything and just writing. Very cool in a decidedly retro way. Hemingwrite is headquartered in Detroit, Michigan. For more information, visit http://www.hemingwrite.com. As many of you know, for the last several years we have been running two separate web properties, this site and a technology site called Teknoholics.com which featured my gadget and technology reviews as well as my family's take on various technology products. In recent months it has become clear that the best path to take from a marketing standpoint would be to concentrate on building a single brand, and combining the content. What this means for most of you is that in addition to all of the great food and beverage content you have already enjoyed, you will be getting technology reviews and our observations on life and lifestyle products. We hope you enjoy the changes. I've posted before about how fortunate I feel to be able to work with the folks at Rock Creek Church in their Pantry, preparing meals once a month and now working as part of the distribution team that helps provide food for more than 125 families every week. One of the jobs I have taken on is making the weekly run out to Unger Farms to pick up the produce they sho generously have donated this summer from their harvest. Every Monday I have been going out to their farm store too pick up what has been left from their weekend visits to local farmers markets and their own stand. So far that has been more than 1000lbs of fresh produce which we have been able to give to families all over Washington county this summer. Local people giving back to the community is amazing to see, and even more amazing to be a part of. If you have the opportunity please find a way to give back to your community. 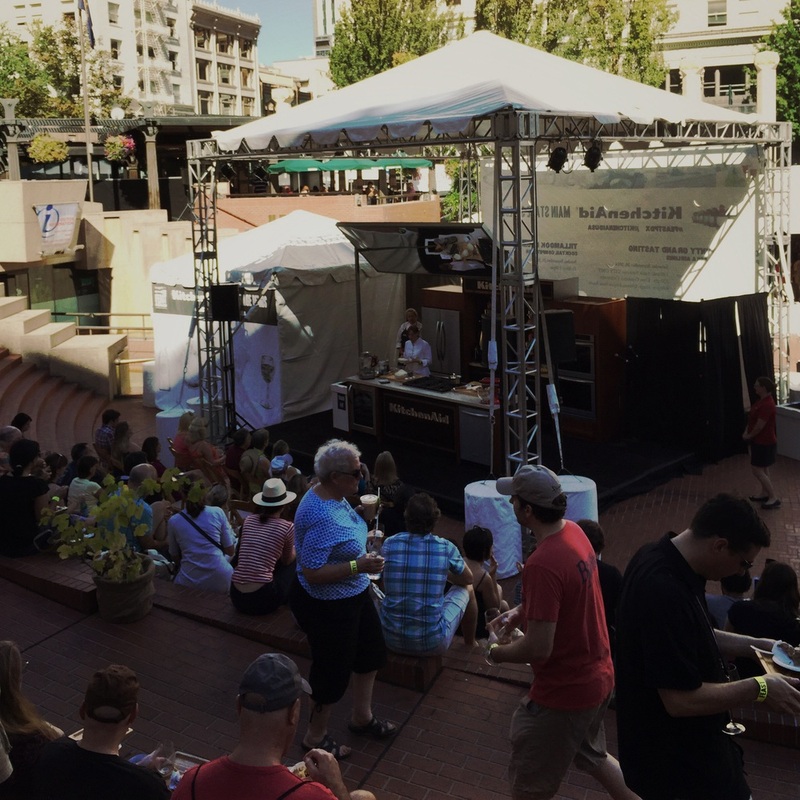 FeastPDX is the Northwest's premier food and beverage event. Founded in 2012 by Mike Thelin and Carrie Welch, Feast Portland showcases local culinary talent and Pacific Northwest ingredients alongside internationally recognized chefs, culinary professionals and industry leaders. Feast Portland is also a festival with a mission, donating its net proceeds towards ending childhood hunger in Oregon and around the country through Partners for a Hunger-Free Oregon and Share Our Strength. The centerpiece of the festival is the Oregon Bounty Grand Tasting, a two day event in Portland's Pioneer Courthouse Square on Friday evening and Saturday afternoon. Featuring sweet and savory baked goods Pacific Pie served an amazing sausage roll. Whole Foods, a featured sponsor of the event had a large tent set up on the upper level of the square featuring local products they were debuting in their styles from Portland vendors. 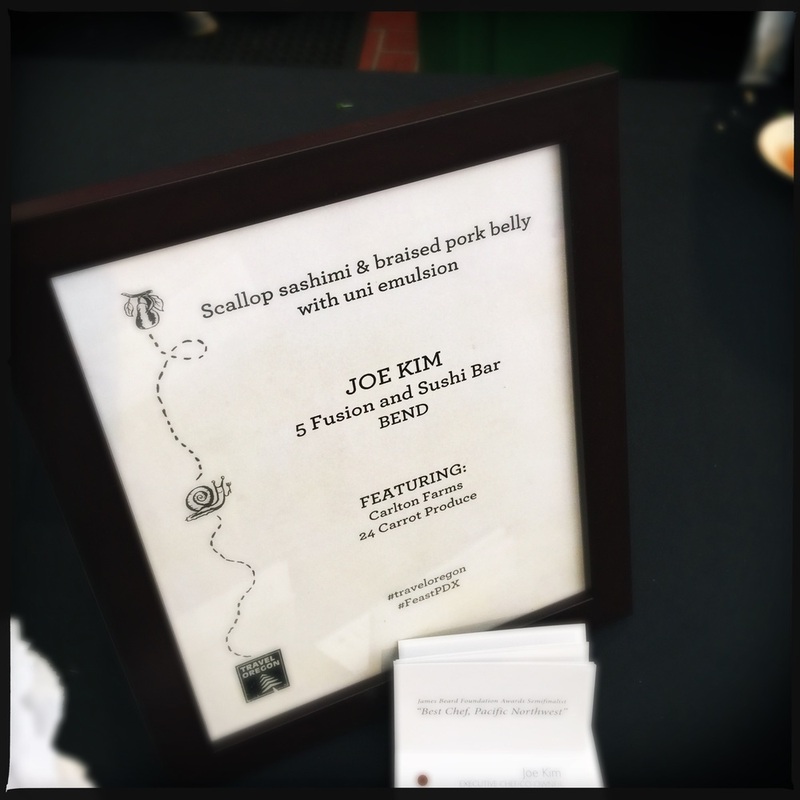 And there you have it, the sites and food of Feast Portland's Grand Tasting for 2014. I'm already looking forward to next year's event. Up next, a new event for this year, the Tillamook Brunch Village. "You know the story of Maker’s Mark®, but maybe not the whole story. While my grandfather can take full credit for crafting the soft, full-flavored, distinctive taste of Maker’s Mark®, it was my grandmother, Margie Samuels, who named all of the children and the family whisky. I am honored to announce that after nearly 60 years, my grandmother is getting some well-deserved credit. Margie Samuels has been selected as this year’s only inductee into the Kentucky Bourbon Hall of Fame, established by the Kentucky Distillers’ Association, in recognition of her role as a pioneer in the industry. Margie’s eye for design was truly visionary, although she’d never use words like that to describe her idea. 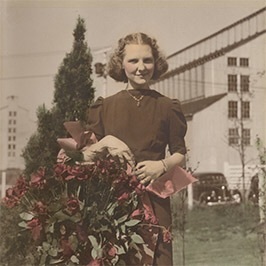 Aside from relinquishing her kitchen for use as my grandfather’s test lab, Margie was the one who came up with the distinctive design of the Maker’s Mark package – from the unique bottle shape to the name. Inspired by a pewterer’s mark, Margie suggested Maker’s Mark. She even came up with the original design for the label. She liked things simple and chose black hand-lettering on cream-colored paper, putting her calligraphy skills to good use. Margie crafted the “maker’s mark,” beginning with Star Hill Farm, the family property, and then adding the S for Samuels and the IV that symbolizes the generations of our family’s distillers. She also insisted the trademarked symbol be molded into the glass of each bottle of Maker’s Mark. Inspired by her collection of 19th-century bottles of cognac, she got out the family deep fryer, filled it with wax and dipped the first bottles right in the kitchen. The family deep fryer would never be the same! Margie will officially be inducted into the Kentucky Bourbon Hall of Fame on Wednesday, September 17, and, in celebration, we will host complimentary distillery tours that day for all visitors who wear red shirts and mention Margie’s name. We raise our glass to her as we celebrate National Bourbon Heritage Month." We at Fat Boy Heaven also raise our glasses to Margie and all the other women who have made Bourbon America's official spirit.